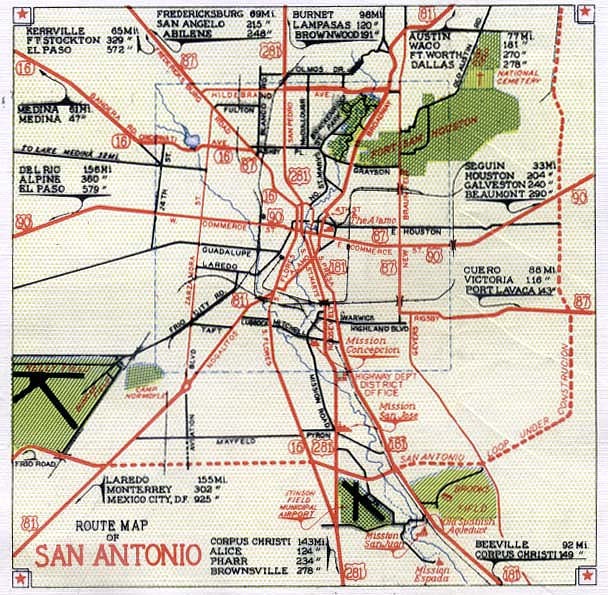 A while back I discovered an amazing book called Place Names of San Antonio by David P. Green. Anyone who has ever driven through San Antonio can appreciate the mind-boggling complexity of the City’s layout. The City planners seemed to have had either a twisted sense of humor or a complete disregard for logic. This is the City where a street will run for a few blocks, and then, for no apparent reason whatsoever, all of a sudden change names–only to reappear a few blocks later under the original name. There are streets that have been completely closed off by buildings, so that now they are essentially large, well-paved smoker’s areas. There are Polish towns with German names and streets named after snake attacks and high schools named after non-existent towns and even a little town nearby named after a pipe lost in a creek during an Indian attack. It’s a tangled history, but Green’s book goes a long way towards mapping it. This book gives such a detailed history of San Antonio, and from such a unique perspective, that it has become one of my most frequently consulted reference guides. Highly recommended. 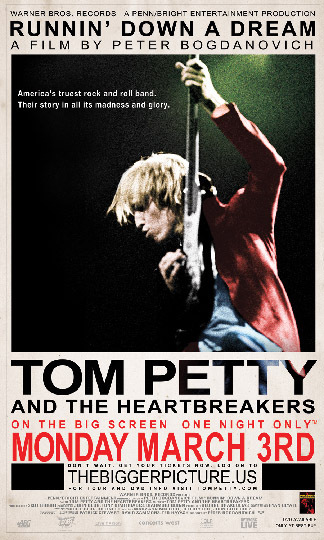 Tina and I went to see Tom Petty and the Heartbreakers in concert last night and the show was fantastic. After all these years, Tom and the boys still put on one hell of a great show. They played for about two hours and had the audience on their feet through the entire show. And it’s that last part, all those aging rockers, beers in hand, swaying to the tunes, that really got me thinking. Tom Petty is one of those artists blessed with a long career. His earliest hits with the Heartbreakers go back to 1976, and his blend Bob Dylan-style lyrics and pop-savvy melodies have kept him on the crest of superstar status ever since. He’s one of those singer-songwriters who have managed to make themselves the soundtrack for three generations of American teenagers. Those of us in that middle generation, the children of the mid 80s, are older now. We’ve got daytime jobs and responsibilities and going to a concert these days generally involves finding a babysitter first. Well, Tina and I got my brother to watch the kids, and we stayed out way later than we normally do, and here I am the next morning, staring bleary-eyed at the computer, wondering if maybe the music I’ve enjoyed for decades hasn’t aged more gracefully than I have. A scary realization, if it’s true. But is it? Last night, I had a great time listening to “Renegade” and “American Girl” and “Breakdown” and yes even “Honeybee.” At one point, when Tom belted out those big open chords at the opening of “Runnin’ Down a Dream,” I turned to my wife and saw the joy on her face, and it made me think that maybe I’m not so not so old after all. I still take great joy out of the moment, and just because I have to get a babysitter before I have that moment, doesn’t take one iota of meaning from it. I may listen to fossil rock, but I haven’t fossilized. Not yet. I am a lifelong fan of short fiction. I just love short stories, can’t get enough of them. Well, we all know that publishing is a risky business. It’s hard for publishers to get a foothold and keep their role in the marketplace commercially viable. And often times, the publishers that get hit the hardest are those that publish short fiction. This has always been the case, I think. But it seems to have become even harder for dead tree publishers these days due to the popularity of online publishing. Now we all know that the quality of online magazines is uneven at best. That’s just part of the territory. But I’d like some opinions on who the good guys are. What magazines do you feel publish the best short fiction? Writers, who is the best to work for? Well, I am gearing up for my panels at ArmadilloCon 2008 this August 15-17, 2008 in Austin. One of my panels is on Vampire fiction–Where has it been, what’s hot right now, where is it going from here? I’ve been doing a lot of research, a lot of reading and rereading, because I like to be very well prepared when it comes to these panels, but I also realize the benefits of consulting the communal mind when it comes to such a broad topic as this. What about it folks? Tell me what you think about vampire fiction. What does the genre need to do to stay fresh? I’m going to be in Austin later this month attending one of Texas’ oldest and largest science fiction conventions, ArmadilloCon 2008. It’s going to be a great Con this year, featuring guests of honor John Scalzi, author of Old Man’s War and The Ghost Brigades, and Joe Haldeman, author of the SF classic The Forever War, Forever Peace, Old Twentieth, and The Hemingway Hoax. I’ll be sitting on a few panels, signing books, shaking hands at the meet and greet ceremony, and reading passages from my upcoming novels Quarantined and Peacekeepers. Here’s what I’ll be doing there. 7:00 pm to 8:00 pm – I’ll be at the opening ceremonies in the Phoenix North Room. 8:00 pm to 9:00 pm – I’ll be at the Meet the Pros party, where I’ll be talking with readers and some of my favorite writers. 11:00 am to Noon – I’ll be autographing copies of Dead City, The Sound of Horror, and History is Dead in the Dealer’s Room. 2:30 pm to 3:00 pm – I’ll be reading passages from my upcoming novels Quarantined and Peacekeepers and answering questions in the Fourth Floor Capital Room. I’ll be wandering the floor, attending the panels, and generally having a great time. Hope to see you there!